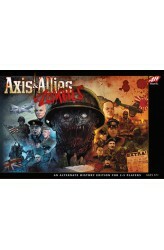 In Axis & Allies & Zombies, a new take on the iconic World War II strategy board game, each player takes command of one of the major powers, joining either the Axis or the Allies. Players then fight for victory against the opposing faction and a terrifying new foe: zombies. In this game that features streamlined game play, curveballs like chainsaw tanks and zombie mind control rays, and a zany storyline, will players survive the onslaught or succumb to the uprising? 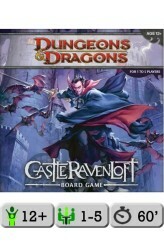 https://www.youtube.com/watch?v=oGmJXeAnKeg ..
Castle Ravenloft Boardgame by Bill Slavicsek, Mike Mearls and Peter Lee The master of Ravenloft is having guests for dinner – and you are invited! Evil lurks in the towers and dungeons of Castle Ravenloft, and only heroes of exceptional bravery can survive the horrors within. Designed for 1-5 players, this boardgame features multiple scenarios, challenging quests, and cooperative gameplay. Each player selects a hero; a ranger, rogue, warrior, cleric, or wizard. On their turn, each player can explore further into the dungeon (turn over new tiles), move through the already explored parts of the dungeon, and fight monsters. When a new dungeon tile is revealed, there is typically an encounter of some sort, and new monsters to fight are added. 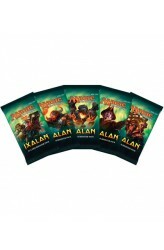 Slain monsters reward the players with t..
"War has come to the Dungeons & Dragons world! In the north, the undead legions of the Dark Empire of Karkoth march against the fragile League of Nerath, determined to sweep away the human kingdoms forever. To the south, the infernal Iron Circle launches its own goblin hordes in a campaign of conquest against the elves and corsairs of Vailin. From the snowy expanse of the Winterbole Forest to the sun-warmed coasts of ancient Vailin, four great powers struggle for survival." 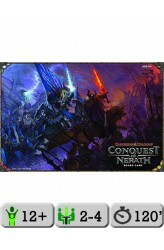 Conquest of Nerath is a fantasy conquest game. 2-4 players muster armies of foot soldiers, siege engines, monsters, warships, elementals, and dragons to attack their opponents. Players employ heroes such as knights and wizards to lead their troops and explore dungeons in the search of magical artifacts and tr..
A cooperative game of adventure for 1-5 players set in the world of Dungeons & Dragons. 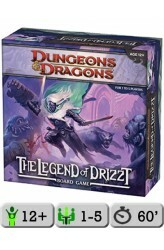 It is named after the book series by the same name recounting the adventures of the dark elf Drizzt Do'Urden and his friends. Designed for 1-5 players, this boardgame features multiple scenarios, challenging quests, and cooperative game play. Players explore the game world, which is built during the game by laying out tiles, using ready-made player characters and encountering enemies with corresponding miniatures. Encounters are generated by drawing cards and resolved using a D20 die. All players win together, depending on the scenario, by escaping, saving others or overcoming a threat. 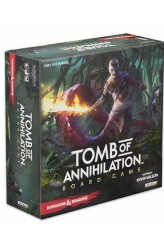 https://www.youtube.com/watch?v=S6Q_DjMoRAQ ..
Tomb of Annihilation Board Game is a cooperative adventure design in the same series as Castle Ravenloft that's based on the "Tomb of Annihilation" storyline for Dungeons & Dragons: 5th Edition. 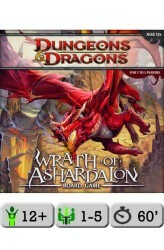 https://youtu.be/zLaHEVzIK4o ..
A cooperative game of adventure for 1-5 players set in the world of Dungeons & Dragons. A heavy shadow falls across the land, cast by a dark spire that belches smoke and oozes fiery lava. A cave mouth leads to a maze of tunnels and chambers, and deep within this monster-infested labyrinth lurks the most terrifying creature of all: a red dragon! Designed for 1-5 players, this boardgame features multiple scenarios, challenging quests, and cooperative game play. Each player selects a hero; a rogue, thief, warrior, cleric, or wizard. On their turn, each player can explore further into the dungeon (turn over new tiles), move through the already explored parts of the dungeon, and fight monsters. When a new dungeon tile is revealed, there is typically an encounter of some sort,..
Waterdeep, the City of Splendors—the most resplendent jewel in the Forgotten Realms, and a den of political intrigue and shady back-alley dealings. In this game, the players are powerful lords vying for control of this great city. Its treasures and resources are ripe for the taking, and that which cannot be gained through trickery and negotiation must be taken by force! 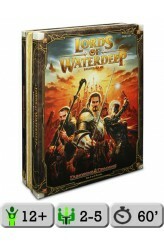 Lords of Waterdeep is a strategy board game for 2-5 players. 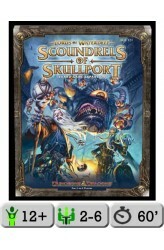 You take on the role of one of the masked Lords of Waterdeep, secret rulers of the city. Through your agents, you recruit adventurers to go on quests on your behalf, earning rewards and increasing your influence over the city. Expand the city by purchasing new buildings that open up new actions on the board, and hinder—or help—the other lords by playing Intrigu..
Iconic Masters features beloved Magic cards from throughout the game's history, including over 20 cards with brand-new art! 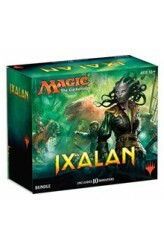 ..
Magic the Gathering: Ixalan - Booster Pack ..
Boosterbox: bevat 36 boosters ..
Magic the Gathering: Ixalan Bundle - 10 Boosters - 1 Card box - 1 Player's Guide with complete visual encyclopedia - 80 Basic land cards - 1 Magic learn-to-play guide - 1 Spindown life counter ..